Anema Residence offers elegant, self-catering villas with a furnished terrace and a private plunge pool, set in a plot of 6.000 m² with vegetables and aromatic herbs. Please inform Anema Residence in advance of your expected arrival time. For this, you can use the special requests section when making the reservation or contact the accommodation directly. The contact details appear on the booking confirmation. 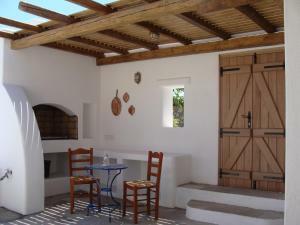 The property offers a free transfer service from the airport or the port. Please inform Anema Residence of the estimated time of arrival if you wish to use this service. The package includes the rental of a car (Hyundai Atos or similar category tourism) every day with basic insurance. This villa features air conditioning, a separate bedroom 1, a terrace with sea views, a kitchen with a fridge and a seating area with a sofa and a flat-screen satellite TV. The accommodation does not include access to the pool.